How does a glasses prescription work? 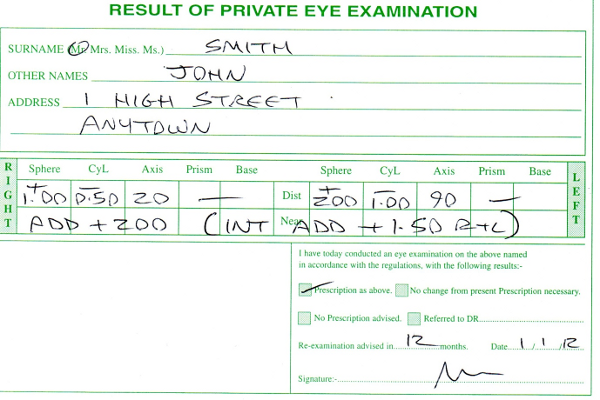 When you have an eye test you will be given a prescription by your optician. The prescription is made up of 3 parts. A Sphere (Sph), a Cyclinder (Cyl) and an Axis (Axis). Where reading glasses are needed there may also be a reading addition (Add). Your prescription will be in a Plus + or a minus - sphere and the cylinder can also be in a plus or a minus. It's very important that you put the correct symbol in the correct box. Don't worry, as if we see anything that looks irregular we will contact you prior to making your glasses. I don't know how to enter my prescription online can I send it to you? Yes you can upload it or give us a call on +44 151 347 7206 and we can talk it through with you, or you can skip this section on the order and send an email with your prescription. What glasses do I require? Distance glasses - These are used for television, driving and walking around. Reading glasses - These are used for close up work i.e. reading, computers and looking at photographs. 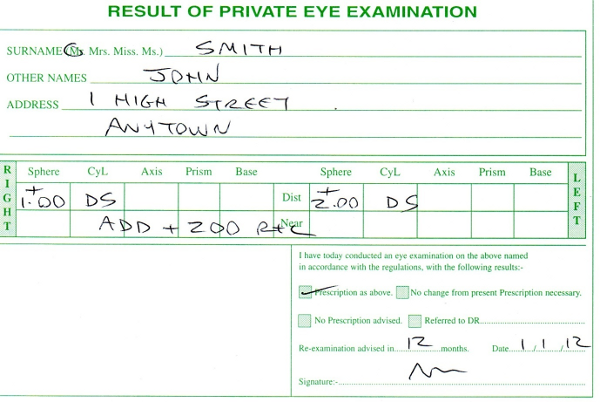 If you require reading glasses then you may have an add on your prescription. Seen on the second row, this may be incorporated or written separately, please see the diagrams above. Intermediate glasses - these are generally used for computer work. If you require intermediate glasses then you have more than one add on your prescription. Seen on the second row in the diagram below, it usually will say "Add +... (INT...)" this is your intermediate add. All you have to do is enter the intermediate add into the prescription page. A PD is a pupillary distance. It is the measurement between your pupils. This measurement allows us to set your glasses so that the lens is at the centre of your pupil giving you the best vision possible. You can get this measurement from your optician but it is not generally put on your prescription so you may have to ask for it. Alternatively you could do your own measurement, we can post you a PD rule for this purpose. PDs are done in millimetres. An accurate PD is very important. Ideally this should be measured by an Optician. If you cannot obtain this then we will estimate it for lower prescriptions. However for higher prescriptions it is necessary to have the measurement. We will be happy to do this for you in our practice but if you are too far away we can do this remotely. We will post a PD rule out to you and if you take a photograph of yourself with the PD rule we can calulate the PD from the photograph. For bifocal and varifocal measurements we may send a frame out for you to take a photo. Bifocal Glasses - This is both your distance prescription and an inset in for your reading. The reading section can be seen as you will usually have a faint line or curve depending on which shape you choose. We supply D-Shaped bifocals as standard but you can call us if you would like a different shape. We can estimate the bifocal height and PD but it would be more accurate if we post the glasses out to you before they are made so we can get a photo of you wearing them to accurately determine the heights. Varifocal Glasses - These are distance, intermediate and reading all in one. So they can be used for distance use, computer work and reading work. The lenses on these are all merged into one so there is no line on them. In the case of varifocal glasses it is essential to get the height exactly right so we need to post the glasses out to you so that we can get a photo of you wearing them. I have a high prescription, do you have my lenses? We can supply any prescription but there may be a charge if your prescription is outside standard parameters, usually 6 SPH or 4 CYL. For higher prescripions will we need an accurate PD, which either will come from your optician or will will send you a PD rule with instructions. I have a contact lens prescription, can I used this to order glasses? No unfortunately you cannot use a contact lens prescription for glasses as it is often a different power. 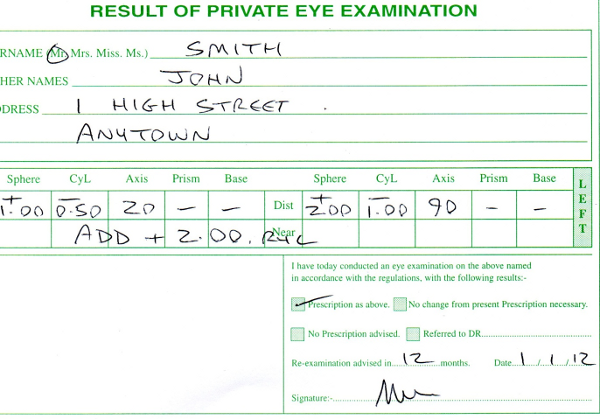 Yes if you have a frame that you would like to use you can send it to us and we will put your prescription in it. Price will vary depending on your frame and the lenses you require. Please tick the own frame option. Can I try the frame before ordering? Yes just purchase the frame only. If you decide you like it, send it back and we will charge you the difference for the lenses. If you don't like it send it back and we will give you a full refund. Will the frame fit me? If you already have a frame that's comfortable the best thing to do is to order one that's a similar size. The frame size will be in your current frame. Please see below. The frame size above is a 54x18x145. The 54 is the lens diameter. The 18 is the nose bridge size and the 145 is the side length. All of the measurements are in millimetres. Do you do children's glasses? The supply of children's glasses should be done in the presence of a registered Optician. We don't supply children's glasses online but we do in the practice. We have a large collection of free children's glasses(with an NHS Optical Voucher). We accept all major credit and debit cards. We also accept payments by paypal. In addition you can also pay over the phone. We only accept NHS Vouchers in the practice, not online. If you are not 100% satifisfied with your glasses or if you change your mind and no longer like the frame or colour then we are happy to refund the glasses or supply a new pair free of charge within 14 days. Please note that some lenses require special order and cannot be refunded. All of our frames come with a 1 year manufacturer's warranty. Delivery times vary (please see our delivery schedule). Most orders take between 7-10 working days. If we have your item in stock we can usually get them dispatched the same day of within 2-3 working days. Please note that if an item is on our site, it doesn't mean it is in stock, due to the extensive colours and sizes in some ranges. Please call to check if needed in a certain time frame. For all designer frames and sunglasses we use DPD, who offer a next day courier service (if your item is shipped on a Friday then your delivery will be the following Monday). DPD will usually contact you via email or phone (if supplied) with an hour delivery slot. If the time isn't convenient, you can rearrange to another day or select a safe place via the email link. For all our standard frames, we usually dispatch these via Royal Mail. Most of our items are shipped via DHL Express. Yes, all of our products come directly from the manufacturers, which are mainly based in Italy. Whether you buy from us or on the high street, the product will be the same. All of our products come with the branded case and cloth (with the exception of Oakley frames, which sometimes only come with a soft sock case). All of our products come with a 12 month manufacturers warranty. Why are your prices so much cheaper than the high street? We try to be competitive with our prices to match other online retailers. We set our prices at 30-35% less RRP. 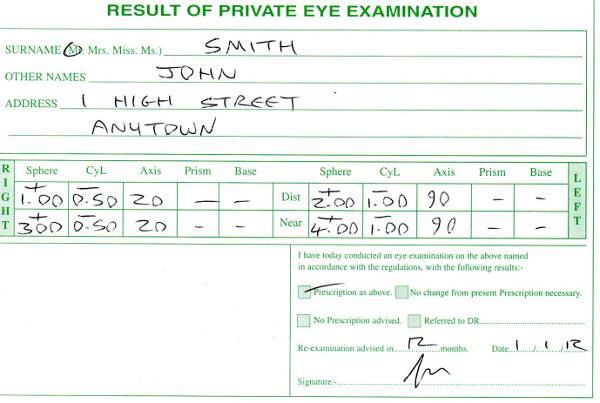 High street opticians usually include an after care service, which is reflected in their prices. Are your prices the same in store as online? Unfortunately our in store price is usually more expensive than our online price. This is because our store prices reflect the after care service, which our online prices do not. Please also note that our online offers and discounts cannot be used in our store. We do, however have seperate offers in our stores that are not available online. Although we do have a large selection of our most popular models and brands in stock, we cannot stock every item, as this would involve additional storage costs and would mean having to increase our prices. We therefore only stock the most popular, which allows us to be more competitive with our prices. If you have a promotional code that isn't working please contact us and we will look into this for you.